There is nothing more personal and intimate than bringing your new baby home for the first time. This session is perfect for capturing those very personal memories forever in the comfort of your own home. In-Studio Photo Sessions: you come to me in my Allendale, NJ studio where you will find everything you need for a perfect and smooth photo session. In-Home Photo Sessions: I will come to your home with everything you need for a perfectly customized photo session, including blankets, baskets, hats, headbands, diaper covers, etc. This will allow you to pick and choose what works best for you and your baby in your home. This session usually lasts around 2 hrs. The session fee of $300 includes my time preparing, traveling, and capturing your little one as well as any post production time spent making every image perfect with professional and expert touch ups. This session includes your infant, two parents and two siblings*. All Infant Photo Packages INCLUDE the Session Fee of $300. Spend $900 on Infant Packages*, Prints, and/or Products and receive a Complimentary Digital Download of your entire Album. For more photo package options, visit my Photo Package Pricing page. 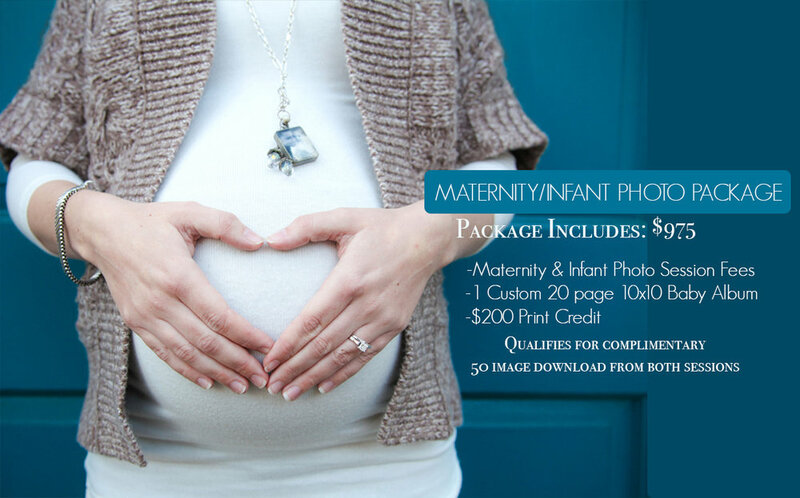 *Baby's First Year Photo Package includes 50 Digital Downloads of your favorite images from the 3 photo sessions combined. Please keep in mind when printing with your own printing company, no two companies print the same. Your images may appear too dark, or come out looking blue or green. This is because they use programs that make adjustments to the light and coloring through auto-settings. Printing through Halley Ann Photography ensures every one of your photos comes out exactly as it was intended to be... beautifully. Mounted prints are printed and mounted on high quality, thin Styrene board to ensure your larger size prints stay crisp and cannot be bent. Gallery Wraps are a way to turn any photo into a work of art. Beautifully hand-crafted Premium Gallery Wraps give you depth, and beauty to any wall space in your home. Premium Gallery Wraps printed on canvas and stretched around a 1 1/2" wooden frame. Set of 3 4x6 Image Blocks.......$80 - Pair this set perfectly under a single large Image Block to create a beautiful gallery wall. 8x10 Image Block........................$85 - Pair 2 8x10's with a single large Image Block to create a beautiful gallery wall. 11x14 Image Block........................$100 - Pair this with a set of 4x6 Image Blocks for a personalized gallery wall. Perfect for a small wall space. for a larger wall space. More gallery options and ideas available! 20x30 Image Block....................$170 - Pair this with a set of 2 8x10 Image Blocks to create a perfect gallery wall. Perfect for a larger wall space. MORE SIZES, GALLERY OPTIONS AND GALLERY WALL IDEAS AVAILABLE CONTACT ME FOR MORE DETAILS. Premium Image Blocks are printed images wrapped around a block giving the beautiful look of a Canvas Gallery wrap. The Image Block has a similar look to a Gallery Wrap in that the image or design is wrapped around a 1" thick wood block, but is created with a premium lustre image print. Press-Printed Custom Photo Books are a perfect addition to any living room coffee table. They include your entire album printed in a 20 page professionally printed and bound photo book. Also featuring hinged (lay-flat) pages and custom photo cover. These make a wonderful gift to grandparents, spouse, or friends! Mini Brag books make the PERFECT gifts to loved ones, especially Grandparents. Be sure to keep one for yourself to keep in your bag or take to work to share with friends and coworkers! Mini brag books feature Accordion Style Foldout with magnetic covers perfect for preserving your favorite images, printed on high quality photo paper with a hard back Custom Photo Cover. These high end Fine Art Albums beautifully chronicle your wedding day or your baby's first year so you can remember every detail for years to come. Baby’s first year goes by fast. An Album makes a cherished keepsake for all the precious moments and milestones along the way. Also great for commemorating Graduations, Communions, Anniversaries, and all of life’s big events. Featuring full-page Album spreads printed on your choice of paper and mounted to high quality thick pages that lay flat. Each turn of the page is a storyboard or collage to help you remember every detail. There is a one time, flat designer fee for every card design order as each card is professionally and individually designed by Halley Ann Photography which takes time and coordination with you to get them perfect for your needs. I work closely with you to design the perfect card for your family. Make a statement with these beautiful double sided greeting cards or birth announcements, printed on premium pearl photo paper that gives your cards an extra shimmery glow, perfect for the holidays or for the announcement of your newest addition. Crank up the heat. Babies love to be warm, and we love to undress those sweet little bundles to capture them in their most natural state. So crank up your heat or turn down your AC to around 80 degrees about 20 min before your session. Pull out any textured blankets, baskets, headbands, hats, diaper covers, etc. you have on hand that we can incorporate. But no need to stress! I will provide enough of everything we need if you don't have any of these items. Make way for windows! I like to use natural light for infants so I will often use your largest, brightest window space for your infant shots. Tidy up. Listen, I get it, I am a mom of 3. I don't expect your home to be immaculate, but I do like to move around your house and use different elements of your space including the nursery, curtained windows, and your bedroom so tuck away anything you feel necessary to feel comfortable with me in the various rooms of your home. Solids, neutrals, no crazy prints. I like for the baby to be the focus of your album, not your clothing. Think of yourself as your baby's canvas. Coordinate with each other. But don't be too "matchy". Parents and siblings should wear tones that are similar and go well together but don't wear all the same thing. Well fed. Feed your baby before the session starts so they have a nice full tummy. Don't rush your baby either. If you are still feeding your baby when I get to your home, don't stress, I can sit and chat with you (or your hubby if you want a little privacy) and get things set up while you focus on your baby. RELAX. Know that your baby will be in good hands. I have done over 60 infant photo sessions and have been in many different homes. Every baby and family is different and unique and beautiful. We will get the shots that we need, even if your baby is not asleep right when I get there, or if you both got zero sleep the night before and your exhausted, or your little one is just having a fussy day, it will be okay! RELAX! Did I already say this?? It is important because your baby is so well connected to you that they know when you are stressed, and a stressed Mama equals a stressed baby! Have you filled out your model release form yet? If not, click below.